"Market intelligence" firm Superdata says World of Warcraft revenues have dropped an astounding 54 percent over the past seven months. 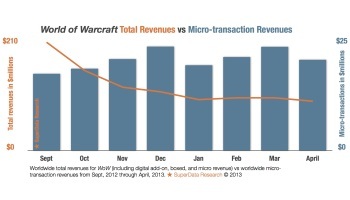 World of Warcraft is still the big dog, but it's not the beast it once was. Subscription numbers are in a slow but steady decline, and now "digital goods measurement" firm Superdata has released a report claiming that revenues - the part that counts - have tailed off 54 percent over the past seven months. Activision Blizzard is in no danger of going under anytime soon, but if the figures are correct it's still an awfully big pile of money that's dried up and blown away. "We believe WoW made $93 million in April in total revenues - not a bad sum - but a far cry from the $204 million it made just seven months earlier," the report states. "Activision also announced a loss of about 1.3 million MAUs from the game's Eastern-hemisphere playerbase recently, a move that our numbers showed in real time. That, of course, is an issue for a subscription-based title." The purpose of the report is to examine the presumed-to-be-looming introduction of in-game microtransactions, which Superdata describes as "a good thing." It also notes that despite the decline in overall revenues, money generated by existing microtransaction options have held steady, indicating "that dedicated WoW players are interested in - and will spend money on - microtransactions." The report also concludes that while going free-to-play can be very lucrative for MMOs, World of Warcraft is unlikely to take the plunge simply because, even with declining revenues, it would require an unattainably high conversion rate to maintain them.